Many people feel the energetic buzz of the Full Moon, and what’s cool to note, is that it means the Sun and Moon are in opposite Zodiac signs. It’s a super charged time, but also one of balance. The solar yang and the lunar yin are in harmony. This is the perfect time to host a new concept in nightlife here in Auckland City, ‘Abundance – A Conscious Evolution in Motion’. Abundance is a night created to uplift your spirit with world wise beats, superfood treats, herbal elixirs with a thriving community of like minded light beaming souls! The night starts at 8PM with Vinyasa Partner Yoga guided by Nicole Moyes. This is an amazing opportunity to get connected, become open, let go, and breath into unlimited potential feeling the LOVE flow!! It’s also the best way to limber up to dance. Book in advance for yoga on the event wall, space is limited > 35 max. Dance is central to the human experience and one of the most natural, healing highs available! Abundance is that space, a place to jump about and shake it all out anyway it feels good. Invite your friends and come boogie to conscious beats, drink health-giving elixirs and let your body take you high! Abundance is held at Auckland’s premier cultural hub, the mighty KFM! $10 tickets on the door (please bring cash) Pre-sales to come. Dancing is from 9pm till Midnight – Dance yourself free! 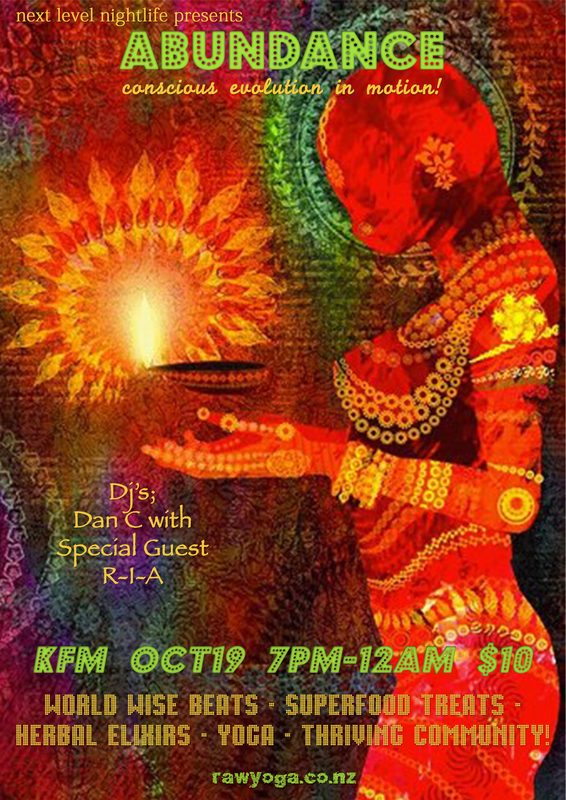 DJ’s Serving a melting pot of world wise beats to energize your spiritual center! Dan C & Special Guest me, R-I-A. Superfood treats and drinks by former Wise Cicada chief Brian Cavanagh! > Parsnip, Pear & Puha with Green Apple & Wild Fennel. > Organic Beetroot, Wild Mint with Pear, Bristly Ox-Tongue, Lemon & Kiwifruit. > Carrot, Lime & Nasturtium with Hound’s Tongue & Wild Tulip.